Divider room is needed not only to minimize the space, it can also use as an art decoration. Actually, to get classic, unique, artistic, and beauty divider, is not have to be so expensive. Think about something different and unique ideas. Explore your creativity. For example, it can be made from your old stuff or anything else, such as rope, pipe, door, etc. Room divider ideas made from wood. Designed to float and has a distance from each other. This unique divider can help light and air circulation to get into the house. Artistic divider made from pipes. They have different size and diameters with one another. This pipe divider can be a substitute for a door or wall. This idea is suitable for small bathrooms. Take utilize the old stuff into something more useful than discarded. You can repaint the window and assemble them into one. Or you can search for wreckage place. No problem, if the window size is different. You can decorate it into something beautiful and attractive that can be used as your divider room ideas. Even the ropes can be artistic when you have brilliant ideas to transform it into your room divider ideas. You did not have to braiding or make things complicated. A simple idea of using wood as a buffer ropes. It is so affordable. If you love photography, has a large collection of photos of yourself or your family, or also loves art pieces, let's use them. We can dive while drinking water, by making such divider wall or wall statement. 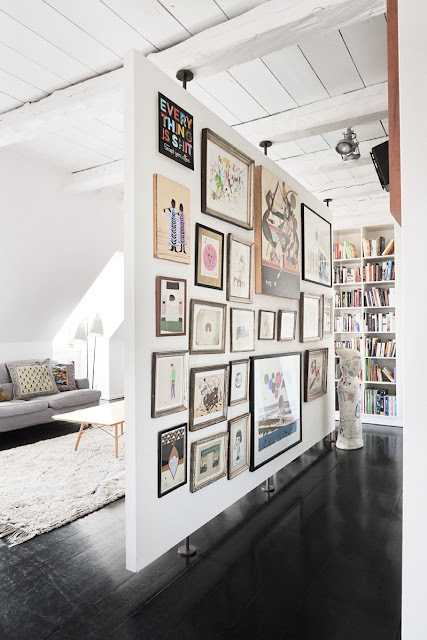 So, we can hang your photographs or art pieces, or anything else there. Utilizing plastic bottles. They are very difficult to be destroyed. Instead of throwing the bottles, what if you turn it into room divider ideas? While the divider make your room become more interesting, you can also save the earth. Win-win, right? The idea was not limited, even a pillow can be used as a amazing room divider idea. Painting the cushion with whatever you want. Well, we need more than one cushion, of course and also we need a statement wall to put them. Maybe this is not a new idea for utilizing plastic bottles as a pot plant. So, we can transform them into room divider ideas that simple, attractive, and affordable. Organize and create distance between one another with wire or metal. For one wire/metal, you can place the 5 pots, as well as others. While you sit, you can relax and enjoy the greenery of plants that you plant.